"My grandma gave me this recipe and I absolutely love it. It's great eating it in the warmer months or any family get-together." Whisk vinegar, sugar, salt, and celery seed together in a large bowl; stir in cucumbers and onion. Cover and refrigerate overnight. Serve cold. I am 76 and I got this recipe from my Mother, so you know it's old! It is one of my favorites. It will last for several days in the fridge, if it isn't eaten before then. wow! Did I do something wrong? It is overwhelmingly sweet!!!!!!!! !I cut the sugar by 2/3's. I use a recipe very simialar too this I just add 1 tsp of Dill. I even freeze this so I can use all the cukes from my summer garden! Great recipe.. 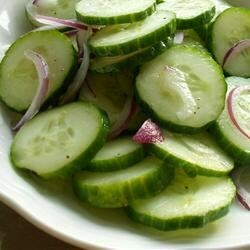 This is tTHE classic cucumber salad. I've even done it with apple cider vinegar. Really the proportions are absolutely correct. These are great! I halved the recipe and it turned out wonderfully. Easy as pie!